The RUDN Journal of Law is a peer-reviewed journal, that publishes original articles on all aspects of law. The Journal’s aim is to cooperation in legal science among Russian and foreign researchers. Special emphasis is placed on contemporary developments of law and state, but the Journal's range includes theory of law and state, history of law and state, legal philosophy. Legislative commentaries, сase commentaries, book reviews and resumés of conferences are also welcome. All submissions are initially evaluated on the basis of the journal’s research quality standards and also content relevance. The journal is published four times per year with a circulation of 500 copies. Oleg A. Yastrbov, Doctor of Legal Sciences, Doctor of Economics, Professor, Director of Law Institute of RUDN University. Marina V. Nemytina, Doctor of Legal Sciences, Professor, RUDN University, Russia. Elena A. Sorokina, Candidate of Legal Sciences, RUDN University, Russia. Aslan Kh. Abashidze, Doctor of Legal Sciences, Professor, RUDN University, Russia. Daulet L. Baideldinov, Doctor of Legal Sciences, Professor, Al-Farabi Kazakh National Univer­sity, Republic of Kazakhstan. Natalia V. Varlamova, Candidate of Legal Sciences, Associate Professor, Institute of State and Law Russian Academy of Sciences, Russia. Tatiana A. Vasilyeva, Doctor of Legal Sciences, Associate Professor, Institute of State and Law Russian Academy of Sciences, Russia. Rima Y. Dzhansarayeva, Doctor of Legal Science, Professor, Al-Farabi Kazakh National University, Republic of Kazakhstan. Vitaly V. Yeremyan, Doctor of Legal Sciences, Professor, RUDN University, Russia. Andrey A. Klishas, Doctor of Legal Sciences, Professor, RUDN University, Russia. Sandra Liebenberg, LLD (Witwatersrand), Professor, Stellenbosch University, South Africa. Dimitrios Panagiotopoulos, Doctor of Law, University of Athens, Greece. Roman Yu. Pochekaev, Doctor of Legal Sciences, Professor, National Research University Higher School of Economics in Saint Petersburg, Russia. Alessandra Pietrobon, PhD in Law, Full Professor, University of Padova, Italy. Nicholas A. Robinson, Doctor of Juridical Sciences (S.J.D. ), Professor, Pace University, NY, USA. Elena V. Timoshina, Doctor of Legal Sciences, Associate Professor, Professor, Saint Petersburg State University, Russia. The information about all the articles published is archived in Russian Electronic Scientific Library (eLIBRARY.ru). The direct URL to the journal issues: http://elibrary.ru/contents.asp?titleid=11970. You can search through article metadata (title, author, keywords, abstract etc.) on eLIBRARY.ru. The URL to article’s full text is available on the article’s page on eLIBRARY.ru. 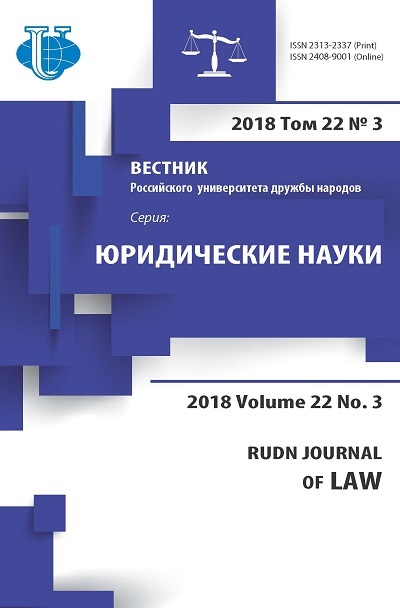 The articles’ full texts are stored on the journal’s server and can be accessed through this page (http://journals.rudn.ru/law/issue/archive) or from each article's individual page on eLIBRARY.ru.